I am as excited about the release of the Last Jedi this weekend as I was as a boy when the original Star Wars trilogy came out. In those early films George Lucas combined wonderful storytelling with breath taking visual effects set “a long time ago in a galaxy far, far away”. His was a believable galaxy; where spaceships and robots carried the patina and dirt of far-off worlds; where chivalry and light sabres stood against blasters and the storm troopers of an evil empire in a battle between the light and dark sides of the Force. We felt a real connection with the characters. Some critics complained that the story line of the first film in the new trilogy, The Force Awakens, was too close to the originals. However, I think the director J. J. Abrams was inspired to return to the roots of the franchise bridging the original trilogy to the new. The story telling was once again exceptional, the characters three-dimensional and the effects visually stunning. Daisy Ridley’s performance as Rey was beautifully crafted. It is tremendous to see the story centre around a female protagonist supported by characters old and new, with Harrison Ford as Han Solo and John Boyega as Finn to name but a few. The Last Jedi, released on Thursday 14th December, has been directed by Rian Johnson. Trailers and interviews have left fans with more questions than answers. Who is the First Order’s Supreme Leader Snoke? Will Rey stand with the light side of the Force or will she join Kylo Ren on the dark side? Who were Rey’s parents? What role will Luke Skywalker play and who is the mysterious Rose? Will the Force finally be brought into balance? One thing is certain Rian Johnson has promised to surprise and shock the fans. 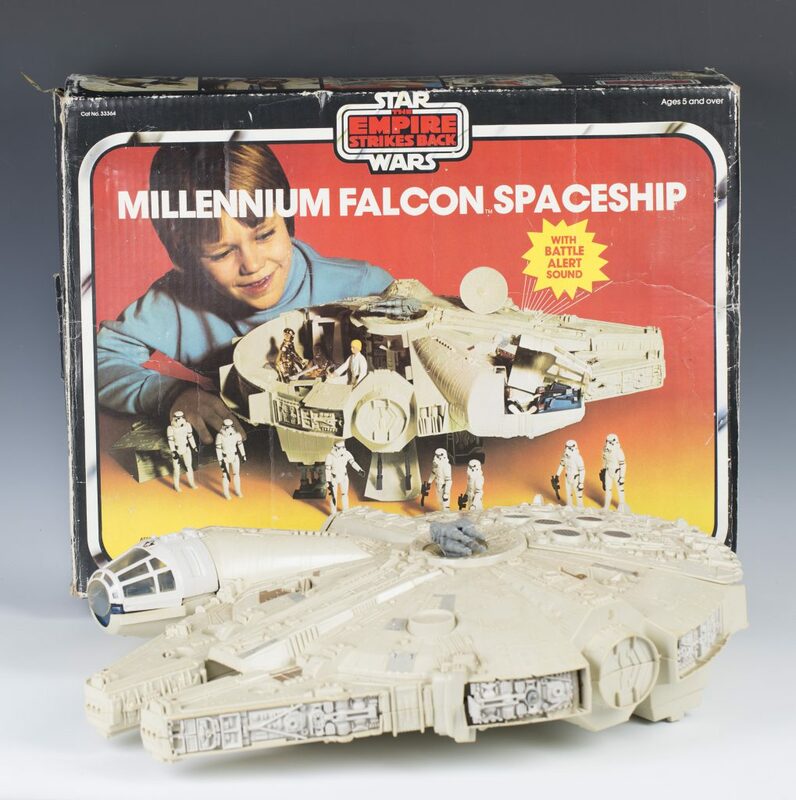 I was thrilled when Father Christmas brought me C-3PO, R2 D2, Luke Skywalker and Darth Vader but my brother hit the jackpot when he was given the Millennium Falcon with Han Solo and Chewbacca. I was delighted to see that the Star Wars fan’s excitement in the early toys and action figures illustrated remains undiminished. They realised hundreds of pounds at Toovey’s specialist Christmas toy sale. 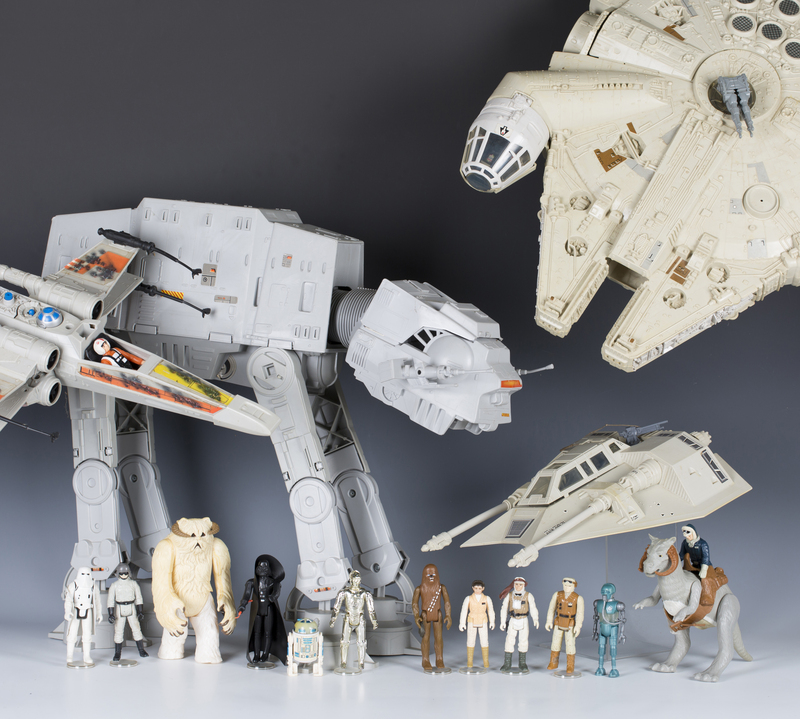 It was very evocative to see Luke’s X-wing Starfighter, the Millennium Falcon, an Imperial At-At Walker and the original characters. Entries for Toovey’s next specialist toy auction on Tuesday 20th March 2018 are being accepted from the beginning of January. No doubt today’s Star Wars fans will be queuing up this Christmas for the latest action figures of Rey, BB-8, Poe Dameron, Kylo Ren, Finn, Chewbacca and Luke Skywalker, as well as First Order and Rebel Starfighters, Star destroyers and light sabres.